Young’s may have run away to Bedfordshire, but there’s still more to London brewing than just the mainstay of Fuller’s and the chemical plants of Annheiser-Busch. We’ve got Brodie’s in Leyton, Sambrook’s in Battersea, Meantime down in Greenwich and now The Kernel in Bermondsey. With my mate Bob living round the corner I’ve heard about The Kernel a few times, along with a recommendation to visit, and after a recent tasting at The Whisky Exchange I stopped in at The Rake and had a taste of The Kernel London Porter ‘forced’ on me by one of the regulars, which moved it up the list quite a way. So, last weekend I braved the sun to wander over Tower Bridge and make my way to the brewery. It’s hidden under the railway arches that run east out of London Bridge and is an almost literal hole-in-the-wall. Every Saturday brewer Evin, a man who I’m fairly certain I’ve bought cheese from at Borough Market before, opens his doors from 9am until 3pm, selling beers from a table set up in front of his office. They are currently brewing once a week and there’s a range of earlier batches as well as whatever has appeared recently – on my trip I picked up a couple of IPAs as well as a London Porter and a bottle of ‘White Ale?’, which from the quick chat I had seems to have not entirely gone to plan, but was bottled as it tasted pretty good anyway. I’ve had the bottles sitting on the side waiting for an excuse to be drunk, so I was very pleased to hear some news this week – The Kernel picked up a gold medal in the best bottled porter category and a bronze in the overall bottled for the Export Stout, and gold for the IPA Simcoe in both beer over 5% and the overall bottled beer categories at the SIBA South East Beer Festival. 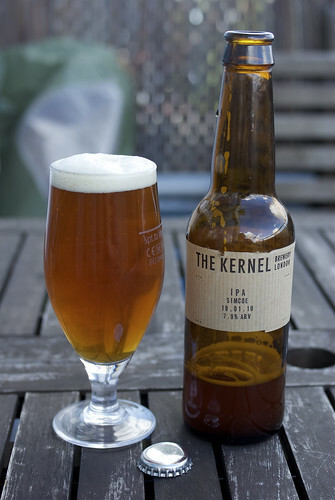 Rather pleasingly my random purchasing from the previous week meant that I had a bottle of The Kernel IPA Simcoe, so I cracked it open this afternoon for a taste. Being an IPA it’s going to have a chunk of bitterness and this is at least in part (although as I don’t know Evin’s recipe, how much I’m not sure) from Simcoe hops, hence the name. The beer pours (at room temperature, anyway) with a good solid head and it has a good malty hoppiness on the nose. It also tastes really rather good – a great hoppy IPA with a kick from the 7.9% and a nice citrus-ness leading to a bitter finish. It’s got a more to it than just the hops, unlike many IPAs, with a good body and slight sourness. It’s bottle conditioned so my school-boy error of pouring half of it before letting the yeast in the bottom of the bottle mix with the remaining beer meant that my second pour was a bit on the cloudy side. If anything it tasted better with a touch of haze as the sediment softened the bitterness a little, but it was good either way. I really like it and will definitely be making the pilgrimage over to the brewery next time I find myself over Bermondsey way on a Saturday, and with Glyn from The Rake pinging Evin congratulations on his blog I might even be able to grab a bottle when I’m out for a beer. 7.9% IPA, £2.50 per bottle from the brewery. 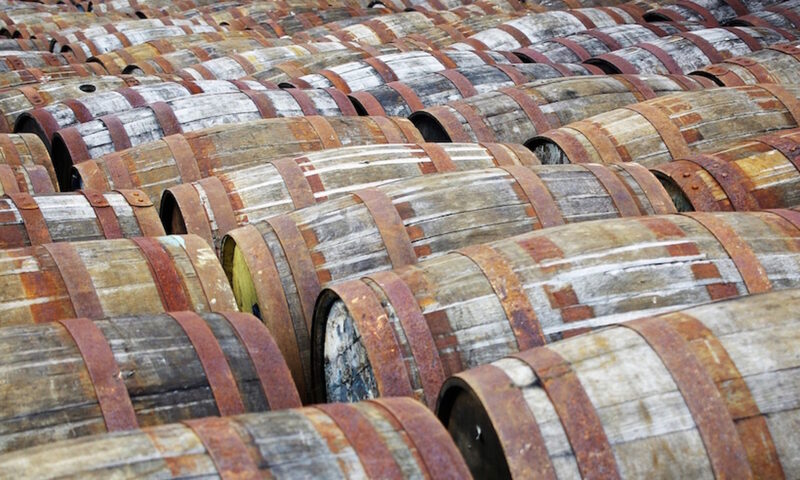 The brewery has a webpage of other suppliers if you can’t make it over there on a Saturday. I’m sure you know the knack that any good old Aussie Cooper’s drinker has learnt for bottle conditioned beers to lie it on it’s side a give it a gentle roll. It mixes the yeast nicely without shaking the bottle dramatically. I’m really getting a taste for good IPAs thanks in large to Brewdog, so I’ll be keen to try this when I’m down South. what would win in a taste off with thornbridge IPA? I have both in my fridge (its a hard life) and the day off….different beasts of course in terms of strength and I have high hopes for a more refined hop experience that is not too boisterous (i have a feeling this is the british way which will emerge in the long run as more popular than US & Scottish hophead invasions). bugger – i lied thornbridge is at work (remaining few bottles of a case). Bottom line is it is that it stands head and shoulders above most bottled beers i have got my hands on this year for my taste buds…I need a tasting notes book because further than that I cannot flesh things out satisfactorily. It has a hoppy finesse that smacks of pedigree thoughtful blending….in my amateur imagination. Are you going to the camra ale fest at earls court in august? fancy booking a day off work for some booze blog ‘research’..? I agree I need to get book on tasting, very amateur myself. I would be there with you at the Beer Festival if I wasn’t up here in the north.